EverLine’s Ottawa office provides experienced and expert painters that can deliver precise and exceptional industrial and commercial painting services. Whether it’s an office or the exterior of a warehouse we will deliver remarkable results. The same commitment to quality we have for all of our line painting services is mirrored in our commercial and industrial painting services. We employ experienced expert commercial and industrial painters and provide them with premium materials and equipment to provide the best job possible. Whether you need a warehouse, commercial building or office painted our discerning painters approach every job with the same accuracy and commitment to quality. No matter the type of industrial or commercial painting project you have in mind we will work closely with you to provide services that meet your budget and timeline. At EverLine we place an importance on having multiple commercial and industrial painting crews to ensure we do not disrupt your business when performing our services. This means we can come and complete your painting project during your businesses down hours whether that be during the day or at night. Having multiple crew also allows us to provide industrial and commercial painting services immediately or have a short timeframe. If you need your project done quickly then the experts at EverLine can help. No matter the size of the project or the timeframe in which it needs to be completed we have experienced and expert painters that can handle the job. We have decades of experience in commercial and industrial painting services, this means we have done it all. Whether your office needs a new coat of paint or you need the entire exterior of a warehouse painted we will deliver the same level of high quality services. Our commercial painting services are exact and will exceed your expectations. At EverLine Coatings and Services we ensure quality by systemizing it and a big part of this is our CORE quality system. CORE stand for clear scope, operations reports, reach out and evaluate. Following this system ensures that we have a clear channel of communication throughout our project process. This allows us to make sure we are meeting and exceeding our clients expectations throughout the delivery of our commercial painting services. What makes EverLine Coatings and Services commercial painting experts in our experience and specialization. 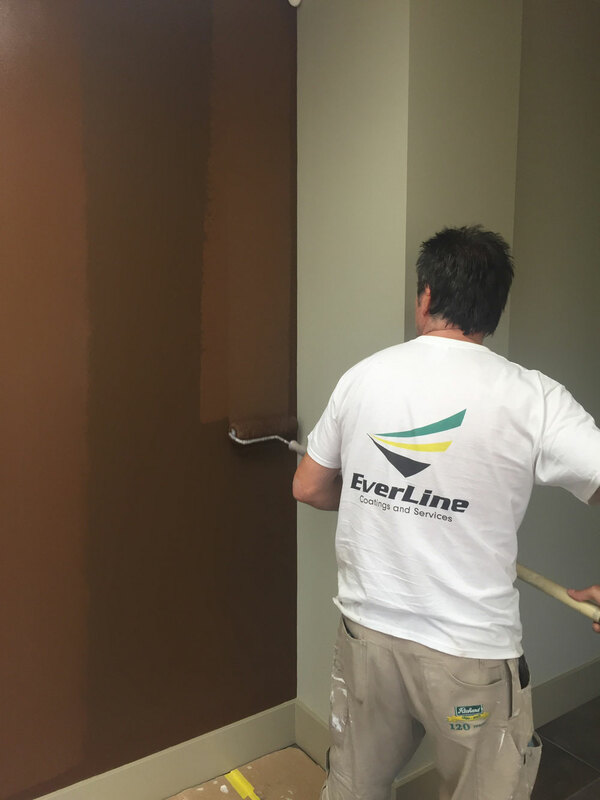 At EverLine we have commercial painting crews with decades of experience, they have seen it all and they have done it all. There isn’t a commercial or industrial painting project that our expert crews cannot handle. What also makes us experts is our specialization in commercial and industrial painting. Many of our competitors will use the same painting crews for all different types of painting projects. At EverLine we have painting crews that specialize in commercial painting. This means when one of our crews arrive at your business you know you are getting a crew that has been specifically trained for your project. We also provide our crews with specialized commercial painting equipment to ensure they deliver the best possible end results. Prior to the arrival of our commercial painting crew at your business there are several things you can do to make sure we can deliver high quality end results in a timely manner. First please clear the area being painted from any obstacles or debris, this will allow our crew to work freely. Also please post notices around where the painting will be occurring, this helps our crew work safely and without distractions. At EverLine Coatings and Services all of our pricing is done on a per job basis. It is important to us to learn about the details of your project and budget before providing a price. This allows us to provide you the best possible value and provide the proper services within your budget. There are so many different factors that can affect the price of a commercial painting project. Please contact us with your project detail so we can provide you with a free estimate.